It can be tempting to forego the pre-visualization process, especially when considering the advent of digital filmmaking. After all, without film stock your footage is now effectively unlimited. You can edit in camera, you’re working with smaller crews, so why not shoot it all from the hip and experiment until you find something that works? No matter how cheap the technology makes the production process, time is always going to be money. The snowball effect that mistakes, arguments, or Acts of God can have are incredibly pronounced on a shoot. When a flat tire or an unexpected rain shower can derail an entire day, the last thing you want when you’re losing light is a debate about the best way to block the next shot, especially when you have thirty or forty people standing around getting paid by the hour. *Celtx does not recommend bringing cocktail napkin storyboards to production meetings. You need to keep a cinematic approach in mind. 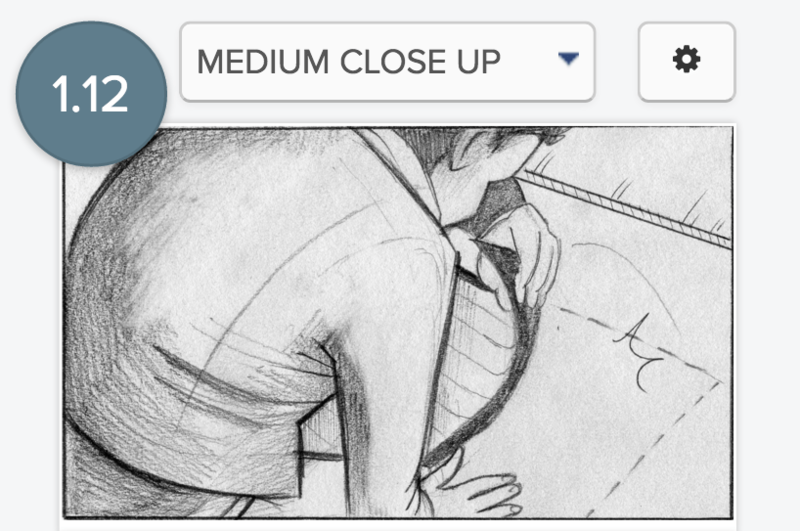 Try to add as much depth and dimension to your storyboards as you can. This doesn’t mean you need photorealistic imagery or an intense amount of detail, but rather properly scaled components. Separate the foreground from the background and create a sense of space. You want to avoid flat, parallel imagery unless it’s functional to the shot. For example, shot 1.9 is an extreme close up of a tumbler lock. Doesn’t get any flatter than that, and that’s fine. Compare it to shot 1.10, however. Adding depth in orientation to something as simple as an over-the-shoulder of someone preparing a microwave dinner makes it seem that much more cinematic, and easier to envision on a screen. Which leads to the next principle. Get yourself familiar with the basic shot types. This very blog features an informative post on the subject for your convenience. 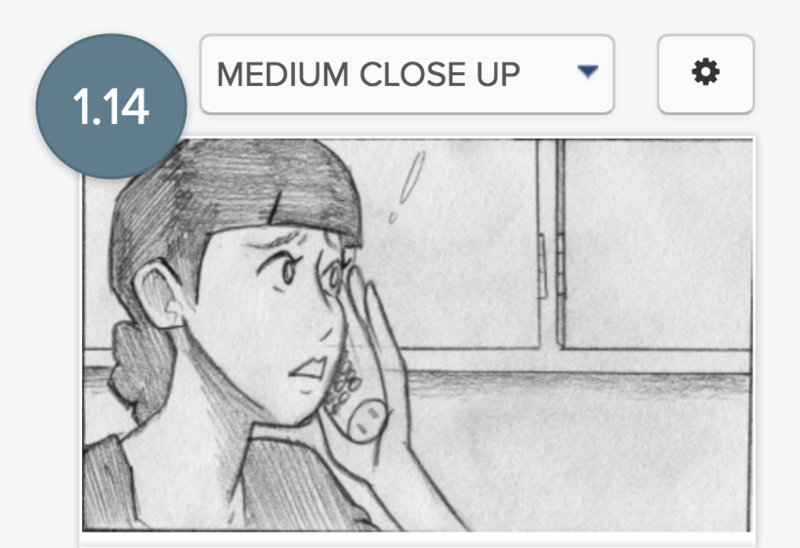 Being able to visualize what the camera itself sees is crucial to creating a storyboard, especially if the script you are basing your storyboard includes framing directions. If you’re picking your own shots, you’ll be able to understand the implications and limitations of each kind, and be able to draw your storyboards accordingly. You should also familiarize yourself with basics of editing, as while each sequence of your storyboard doesn’t need to cover every beat in a scene, it should cover the cuts. Make sure you think carefully about pacing where you plan to move from one shot to the next, and ensuring that those cuts are properly motivated visually within the storyboard. Your storyboard should denote the motion of your characters as well as the motion of the camera. This can be accomplished through use of simple visual cues, such as direction arrows. You can also use cues to suggest reactions, sources of light, and sound effects. Think of it like a comic book. For example, in shot 1.12, you can see how the character’s lifting of the doormat is highlighted by visual cues. In shot 1.14, the exclamation point highlights the character’s reaction to something occurring offscreen. These are the elements that will add physicality to your storyboard, and allow the reader to envision them as moving. Finally, when making your storyboard, try to remain true to the source material. In this case, the source material is your script. Remember that you’re taking the action off the page it turning it into a visual blueprint. By the time you’ve entered the storyboarding phase you should be dealing with a locked shooting script, which will have gone through multiple revisions designed to get it as close to the envisioned finished product as possible. Now is not the time to begin tampering with the content of the story. In Celtx, our Storyboard feature allows you to create multi-sequence story boards complete with shot numbers, captions, shot types, and animatic playback functionality. By integrating your own imagery with imagery created with our built-in Shot Blocker, you can quickly build and organize your entire project’s visual approach. Why not give it a try?